Since the advent of the modern web, performance has been a key consideration when designing a website or a web app. When a website requires no server interaction whatsoever, what is hosted on the web is served to a user as is, this is referred to as a static site. A static site is a site which contains fixed content. In several use cases including event listings, portfolio pages and blogs, static sites are preferred to dynamic websites (requiring client-server interaction) because of challenges including slow load-time, security flaws, and hosting costs amongst others. The absence of a server mitigates these risks. Static Site Generators are tools used develop static sites, effectively and efficiently. Recently the use of static sites is on the rise and various tools and technologies such as Metalsmith, Jekyll, and Gatsby are taking center stage. Gatsby is said to be robust in a way that the static content rendered can be sourced from a large number of sources and formats including markdown, CSV and from CMS like Wordpress and Drupal. All that is required are plugins to handle the data transformation. Plugins in Gatsby are of three categories. Functional Plugins: These plugins simply extend the ability of Gatsby. An example is the gatsby-plugin-react-helmet which allows the manipulation of the Head of our document. Source Plugins: This plugin ‘finds’ files in a Gatsby project and creates File Nodes for each of this files, these files can then be manipulated by transformer plugins. An example is the gatsby-source-filesystem which ‘sources’ files in the filesystem of a Gatsby project and creates File Nodes containing information about the file. Transformer Plugins: Like we saw earlier, data in Gatsby can come from multiple sources and transformer plugins are responsible for converting these files to formats recognizable by Gatsby. An example is the gatsby-transformer-remark plugin which converts Markdown File Nodes from the filesystem into MarkdownRemark which can be utilized by Gatsby. Other plugins exist for various data sources and you can find them here. Else, install Node from here. This installs the CLI tool, then proceed to create a new project with the Gatsby default starter. This should take a while as the tool downloads the starter and runs npm install to install all dependencies. This starts a local server on port 8000. Gatsby’s default starter comes with all essential files we require for development. You can find other starters here and even create or contribute to a starter. Write blog posts in markdown. Display blog post titles on the homepage. View each blog post on a separate page. For these, we will require the three plugins we stated earlier to which will manipulate the <head /> element of our blog, source markdown files and transform markdown files respectively. All styling will be done via external CSS files and in-line component styling in React, however, several other methods of styling Gatsby documents exist such as CSS modules, typography.js, and CSS-in-JS. You can read more about them here. Gatsby runs the gatsby-config.js during build and implements all installed plugins. One great thing about Gatsby is that it comes with a hot reload feature so changes made on the source files are immediately visible on the website rendered. Note the siteMetadata in the gatsby-config module, this can be used to set the value of any element dynamically using GraphQL, for instance - document title and page title. Note the imported CSS file. Gatsby supports the use of external stylesheets to style React components. <Helmet/> is a component provided by the react-helmet plugin shipped originally with Gatsby’s default starter. A Header component is imported and the div to contain all page elements is styled in-line. Gatsby offers the flexibility of creating custom components in react and these components can as well be stateful or stateless. We will stick to using stateless components in this tutorial, like the <Header/> component. We simply made some changes to the styling by changing the background color of the header and aligning the header text to the center. So far we have created the layout of the blog, how about we do some cool stuff by creating blog posts and displaying them on the home page. Web development is a broad term for the work involved in developing a web site for the Internet (World Wide Web) or an intranet (a private network). Web development can range from developing the simplest static single page of plain text to the most complex web-based internet applications (or just &apos;web apps&apos;) electronic businesses, and social network services. A more comprehensive list of tasks to which web development commonly refers, may include web engineering, web design, web content development, client liaison, client-side/server-side scripting, web server and network security configuration, and e-commerce development. title: "The Beginning of The Web"
The texts between the triple dashes are known as frontmatter and provide basic information about the markdown post. We have our markdown post, to render this data, we would employ GraphQL. GraphQL is a powerful yet simple query language. Since its introduction, it is fast gaining popularity and has become a widely used means of consuming data in React. Gatsby ships with GraphQL by default. Since we have previously installed the gatsby-source-filesystem plugin, all files can be queried with GraphQL and are visible as File Nodes. GraphQL also comes with an important tool called GraphiQL an IDE with which we visualize and manipulate our data before passing it to React components. GraphiQL is available on http://localhost:8000/___graphql while the Gatsby server is running. Open up GraphiQL on that address to visualize data. Run the query to see all files in /src/. This returns a list of all files in our src directory as we already specified that when configuring the gatsby-source-filesystem in the gatsby-config.js file. We have all the files in our source folder but we need only the markdown files and their accompanying data like frontmatter and size. The gatsby-transformer-remark plugin earlier installed comes in handy now. The plugin transforms all markdown file nodes into MarkdownRemark nodes which can be queried for their content. Run this query in GraphiQL to fetch all MarkdownRemark nodes and usable data in them. Alas, we have an awesome blog page with details and excerpt from the post content. We need to view each blog post on a separate page, let’s do that next. This is just about the best part of building out this blog, but also a bit complex. We could actually create individual pages in src/pages, pass the markdown content to the document body and link the pages to the blog titles but that would be grossly inefficient. We would be creating these pages automatically from any markdown post in src/blog-posts. We will simply be creating a ‘path’ otherwise known as ‘slug’ for each page and then creating the page itself from its slug. APIs in Gatsby are utilized by exporting a function from the Gatsby-node.js file in our root directory. The createFilePath function ships with the gatsby-source-filesystem and enables us to create a file path from the File nodes in our project. First, a conditional statement is used to filter only the markdown file nodes, while the createFilePath creates the slug for each File node. The createNodeField function from the API adds the slug as a field to each file node, in this case, Markdown File nodes. This new field created(slug) can then be queried with GraphQL. While we have a path to our page, we don’t have the page yet. To create the pages, export the createPages API which returns a Promise on execution. In the createPages API, a promise is returned which fetches the slugs created using a GrphQL query and then resolves to create a page with each slug. The createPage method, creates a page with the specified path, component, and context. The path is the slug created, the component is the React component to be rendered and the context holds variables which will be available on the page if queried in GraphQL. So far we have built out a simple static blog with blog content and pages. It will be deployed using Netlify and Github for continuous deployment. Netlify offers a free tier which allows you deploy static sites on the web. Note: Pushing code to Github and deploying to Netlify from Github ensures that once a change is made to the repository on Github, the updated code is served by Netlify on build. Create an account with Github and Netlify. In Github, create an empty repository and push all files from your project folder to the repository. Netlify offers a login option with Github. Log into Netlify with your Github account or create a new account with Netlify. Click the ‘New site from Git’ button and select your Git provider. Github is the chosen Git Provider in this case. Select Github and choose the repository you wish to deploy, in this case, the repository for the static blog. Next, specify the branch to deploy from, build command, and publish directory. Click the ‘Deploy site’ Button to deploy the static site. This may take few minutes to deploy after which the static site is deployed to a Netlify sub-domain. Here is the demo of the static blog built earlier. https://vigilant-bhaskara-66ed6e.netlify.com/. In this post, you have been introduced to building a static site with Gatsby which utilizes React components to generate static content on build. 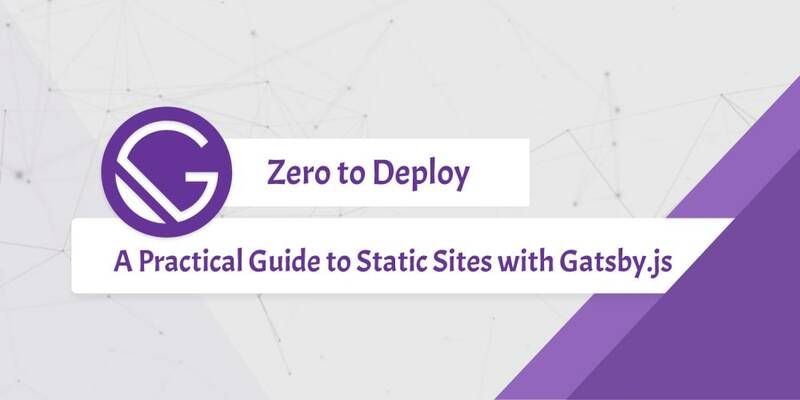 Gatsby offers a robust approach to static site generation with the ability to parse data from various sources with the help of plugins. The static site was also deployed to the web using Netlify. Feel free to try out other amazing features of Gatsby including the various styling techniques as well. Comments and suggestions are welcome and you can make contributions to the source code here.